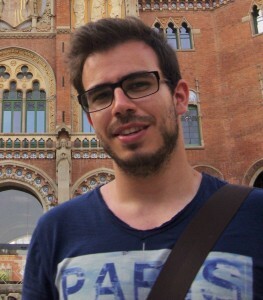 João Pedro Valadeiro has undergraduate degrees (bachelor and master) in Engineering Physics from Instituto Superior Técnico of the University of Lisbon. His PD-FCT AIM project is entitled “Advanced magnetoresistive architectures for ultra-low magnetic field detection”. This project takes place at INESC MN and INL. The thesis is supervised by Susana Freitas (INESC MN and Department of Physcis of Técnico) and co-supervised by Paulo Freitas (INL). His doctoral program started on December 1st, 2015. João Pedro Valadeiro was the first author in the review paper: J.Valadeiro, S.Cardoso, R.Macedo, A.Guedes, J.Gaspar and P.P.Freitas. “Hybrid Integration of Magnetoresistive Sensors with MEMS as a Strategy to Detect Ultra-Low Magnetic Fields”, Micromachines 2016, 7, 88.